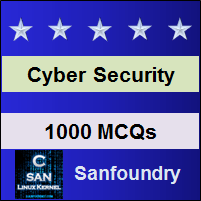 This set of Cyber Security Multiple Choice Questions & Answers (MCQs) focuses on “Data Leakage and Prevention – 1”. 1. _____________ is the illicit transmission of data from inside an organization or personal system to an external location or recipient. Explanation: Data leakage is the illicit transmission of data from inside an organization or personal system to an external location or recipient. The phrase is used for describing data which is transferred electronically or even physically. 2. Data leakage threats do not usually occur from which of the following? Explanation: Data leakage threats are common from web and emails, mobile data storage devices such as internal or external storage and memory cards, from USB drives and laptops. Explanation: Data leakage is also known as ‘low and slow data theft’, which is a massive issue for data security & the damage caused to any firm is enormous. Every day there is at least one report of data theft that occurs worldwide. 4. There are __________ major types of data leakage. Explanation: There are three major types of data leakage. These are – data breach by accident, data leak done by ill-intentioned employees and electronic communication with malicious intent. 5. “Unauthorized” data leakage doesn’t essentially mean intended or malicious. Explanation: “Unauthorized” data leakage doesn’t essentially mean intended or malicious. It has been found that the majority of data leakage incidents are accidental but the loss occurred are severe. 6. Unintentional data leakage can still result in the same penalties and reputational damage. Explanation: “Unintentional” data leakage doesn’t essentially mean intended or malicious. It has been found that the majority of data leakage incidents are accidental but it can still result in the same penalties and reputational damage. 7. When leakage of data is done purposely or because of the lack of employee’s concern toward confidential data is called ___________ done by employees of an organization. Explanation: When leakage of data is done purposely or because of the lack of employee’s concern toward confidential data is called Ill-intentional data leakage done by employees of an organization. 8. Which of them is not an example of physical data leakage? Explanation: Physical data leakage can be done intentionally by criminal-minded people who can fetch data from dumpster diving, shoulder surfing, data mentioned in printed papers or taken out of photocopiers.